The first thing you should do as a business owner or digital marketer after you decide to start an email marketing strategy is come up with a promotional calendar. That way, you’ll know when to send the messaging your customers need when they want to receive it. Using a promotional calendar gives you the opportunity to elicit action. It mobilizes your subscribers to do something that you want them to do — buy something, ask for information, call you, or come to a store, for example. The right message delivered at the right time elicits action. Before you can build an accurate, all-encompassing promotional calendar, you have to know exactly what you’re promoting. Spend some time carefully cataloging every product and service that your business offers and taking some time to understand how to promote it best. You can use a promotional asset sheet like this one. You may be wondering why you should spend so much time cataloging your marketing efforts. Wouldn’t that time be better spent, perhaps, marketing those assets? The truth is that by carefully tracking the sales of your products, as well as the marketing campaigns that correspond with your sales, the job of marketing those assets becomes much easier. When you know what you have available to sell and the results of the promotions you’ve employed in the past, you can simply do more of what’s working and less of what isn’t. The time you spend cataloging and analyzing these assets and the campaigns surrounding them is valuable marketing time. All marketers should gather the promotional assets from all the products and services they offered so that they know exactly what they can sell, how they can sell it, whom to sell it to, and (perhaps most important) when to sell it. After you catalog your assets, create an annual promotional plan. This plan aligns your 12-month revenue goals with your annual promotions and marketing efforts to help you reach your goals. Here is a sample worksheet. An annual promotional planning worksheet. You can download your own 12-Month Promotional Planning Worksheet at DigitalMarketer.com. Write your 12-month revenue goals. 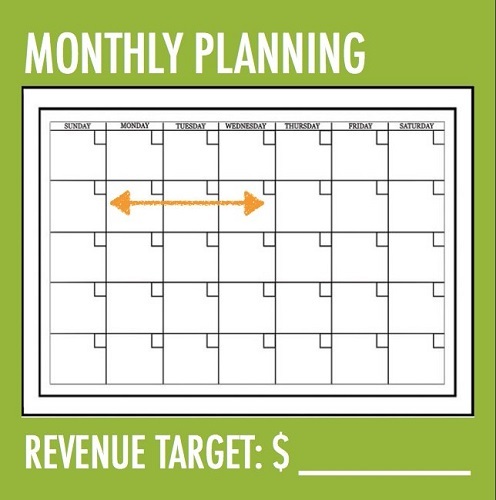 Consider your target revenue goals, and figure out where you want to be each month to reach those goals. This list could include nonrevenue growth opportunities such as the launch of a blog or podcast, the release of a book, or the opening of a new location. Slot holiday promotions into the appropriate months. For many retail businesses, November and December are key sales times and thus require strategic marketing. Other businesses may have peak promotion at varying times, such as before a major conference or during a certain season. Slot annual promotions into the appropriate months. These promotions may include major sales, product releases, or events. Every business has slow and busy months, so note those months in your plan so that you can build appropriate promotion during those times. Slot nonrevenue goals into the appropriate months. Are you planning to release a new book or launch a new blog in March? You need space on the promotional calendar for these nonrevenue initiatives. Break your revenue goals into monthly allotments. Keep seasonality in mind (see Step 5). Add your standard revenue projections. Include promotional efforts, major events, standard rebilling contracts, and subscriptions. Subtract your expected revenue from the target revenue. After doing this, consider how you can fill in the remaining revenue needed. This step is where your marketing efforts come into play. Brainstorm additional promotional ideas that could generate the revenue you need to reach your goals. Will you need to add new products or services to promote to reach your target revenue? Can you find new ways to offer the existing products and services you already have? Ask yourself whether your calendar helps you meet your goals in a way that will be both effective and practical. List additional items that you need to meet your target. You may need to launch a new product or service, or to create a sales presentation, for example. The next step is to get down into the nitty-gritty of what you’re going to do for the next 30 days. For your first 30 days, try setting one of these promotional goals for each week and reserve the fourth week for a wildcard campaign. A wildcard campaign gives you the chance to try something new, get creative, test new ideas, or try to replicate your most successful campaigns. 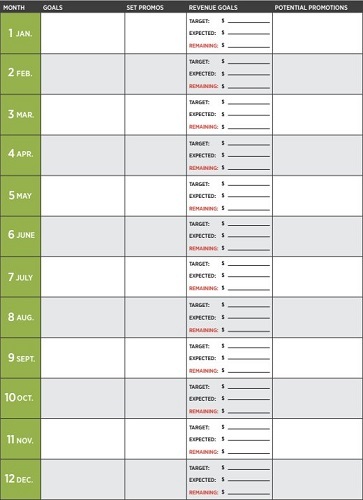 You can use a monthly planning worksheet so that you can easily track which promotions you’re running and how they do. You might also plan a backup promotion for each campaign in case the primary campaign falls, so that you still reach revenue goals regardless of how the campaigns perform. A 30-day promotional planning worksheet. 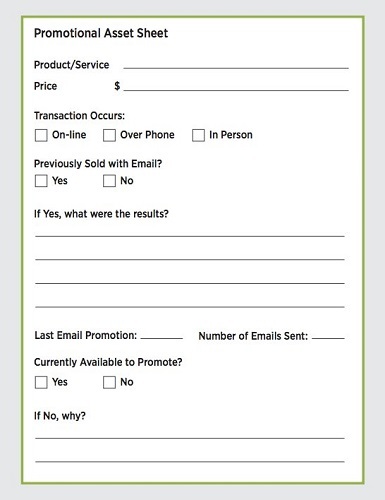 You can download your own monthly email planning worksheet at DigitalMarketer.com. When your 30-day promotional plan is up and rolling, you can plan a bit farther in advance with a 90-day rolling calendar. This calendar is referred to as a rolling calendar because by repeating similar promotions every 90 days or so, you keep your customers informed and engaged without making the same offers with the same campaign goals over and over again. Use a calendar application like Google Calendar or hang a dry-erase board with a 90-day calendar template on it in your office so that you and your team can routinely map out a schedule that meets your revenue targets without repeating the same promotions too often. When viewing your 90-day calendar, you might find that you have three monetization campaigns in April, but none in May. Moving a monetization campaign or two to May will make it more likely that you hit your revenue targets in May and reduce the number of monetization offers you send to your email list in April.